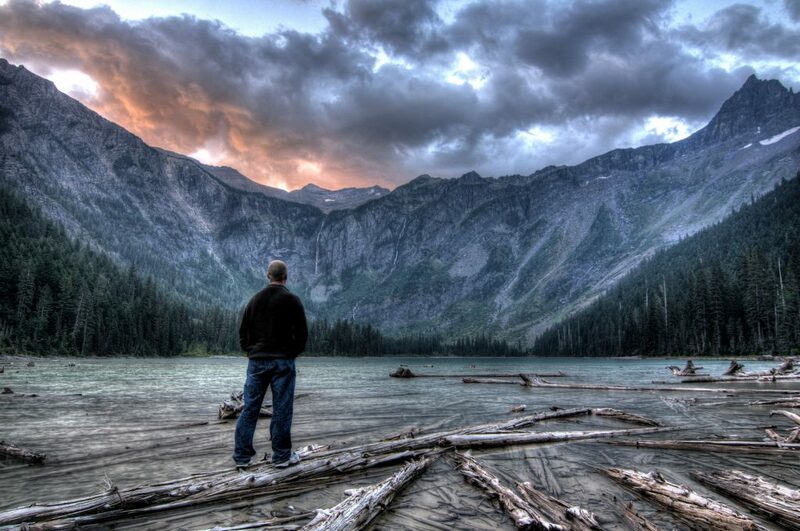 Glacier National Park is where my love affair with the National Parks began. This trip is the stick against which all of my other park trips are measured and all, thus far, have fallen short. This was my first real vacation from work and my first time planning a trip from start to finish. It worked out quite well if I do say so myself. It helped that I had a friend join me. We hiked almost 50 miles, saw 9 bears (including some close encounters), and got a good sampling of the park. John Muir recommended spending at least a month in the park and he was right; our 4.5 days went by very quickly. I will visit Glacier again and I hope to spend more time next time. Glacier National Park is huge. There are hundreds of miles of trails and plenty of experiences outside what I did. The map below focuses on my experience with driving Going to the Sun Road and hiking in the Many Glacier area of the park. My friend and I visited the park in September, about a week before the end of the season when many of the concessions and services shut down. There were definitely people around, but it was not overly packed. We often set out well before sunrise and had hours to ourselves while people ate their breakfast and waited for things to warm up. This trip was a while ago, but I still remember having decent weather. It was chilly in the morning, but nice in the afternoon; the kind of weather I like. There was a short period of rain, but otherwise it was dry. The biggest weather issue we faced was wind. It flared up several times. Wind is my most hated of weather conditions. 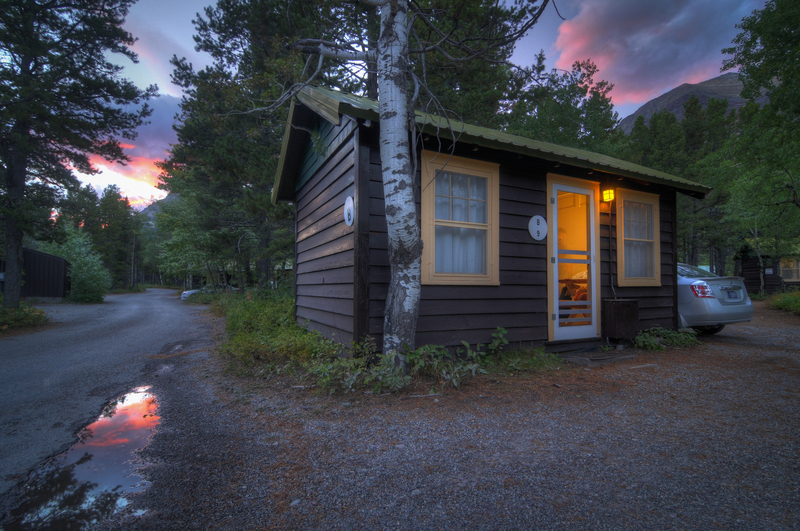 We stayed at the cabins at the Swiftcurrent Motor Inn in the Many Glacier area of the park. The Inn is perfectly situated at the trailheads for some of the most spectacular hikes in the park. The cabin we stayed in had a common room with a sink, cabinet, table, and coffee maker, and a separate bedroom with a full-size bed. My friend and I sharing a bed isn’t the way I would have planned things, but he decided to come along a month or so before the trip and by then it was too late to change to something bigger. Which brings up another point; you have to book well in advance. I made my arrangements about 6 months ahead of time, just to be sure I had my pick of times and cabins. 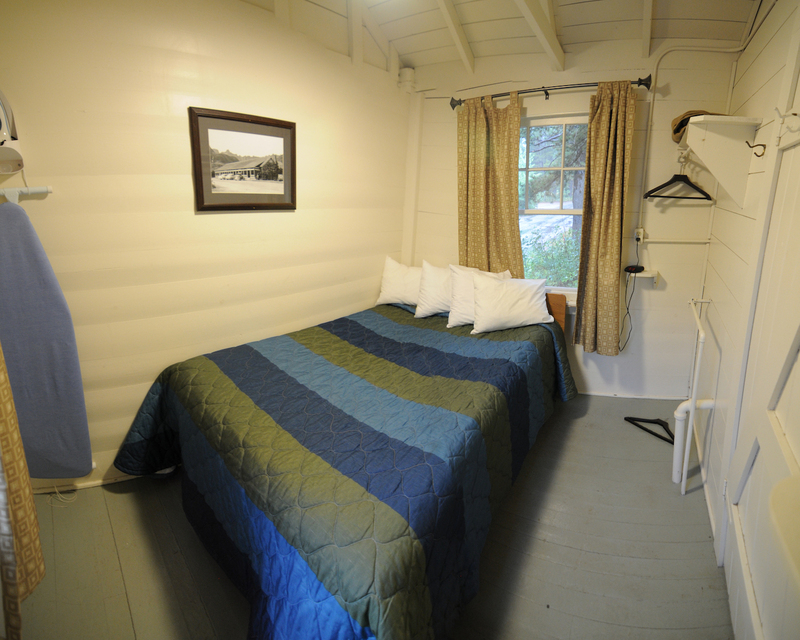 The accommodations inside the park are limited and staying outside the park means a lengthy drive in the morning or evening. 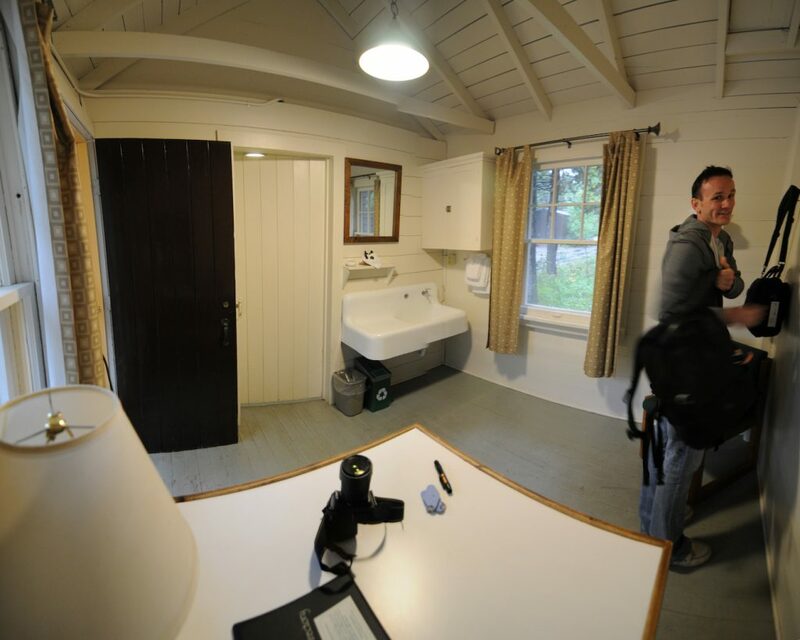 The cabins do not have their own bathrooms. They are set up in pods around common bathroom buildings. This was a bit annoying, but reasonable for the price. 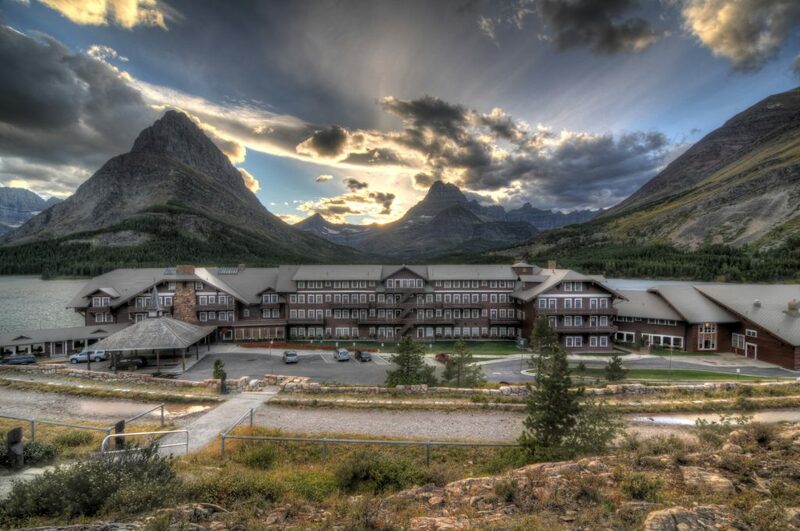 The Swiftcurrent also has hotel-type rooms with bathrooms and the Many Glacier Hotel is down the road for those with a bit more money to spend. We flew into Great Falls, MT and picked up groceries there before heading into the park. That is where we got most of our meals from; especially our lunches that we often ate while out hiking. We ate at the dining room in the Swiftcurrent Motor Inn a few times and also ate at some restaurants while out driving (I don’t remember which ones). The food at the Swiftcurrent was good and a welcome relief from the granola bars, jerky, and cold soup I’d been eating for lunch. Glacier is one of the few places that I dedicated enough time to get both broad and deep experiences. Chris and I spent most of our 4.5 days in the Many Glacier area of the park, but we also drove Going to the Sun Road and visited Logan Pass, two must-dos in the park. This trip was also made better by having a traveling companion, my longtime friend Chris. I often tell myself that there is joy in being alone on trips like this, but it is a qualitatively different experience when you can share experiences with someone and have someone who forces you to get outside your comfort zone. Chris helped with both of these things on this trip. There are some mornings I might have slept in and some trails where I might have turned back. So to sum up, bring someone who will motivate you to keep going. I made flight and hotel arrangements for this trip about six months ahead of time. That gave me a long time to research and daydream. I found the planning very helpful. I looked at a lot of people’s photos and blogs, but the most useful information I found came from a YouTube channel where a guy discusses various hikes you can take in the park…particularly those in the Many Glacier area. Chris lives in Denver so we met at the airport in Great Falls, MT. We rented a car and went to buy some groceries. From there, we made the 3.5 hour drive to Glacier. There are closer airports in Kalispell, but they are on the other side of the mountain range so the drive to the Many Glacier area turns out to be about the same. I don’t remember the difference in plane ticket prices, I just remember it was cheaper to fly into Great Falls. We arrived in the Many Glacier area a couple hours before sunset. It was overcast and drizzling; not how it had appeared in my daydreams over the prior 6 months. 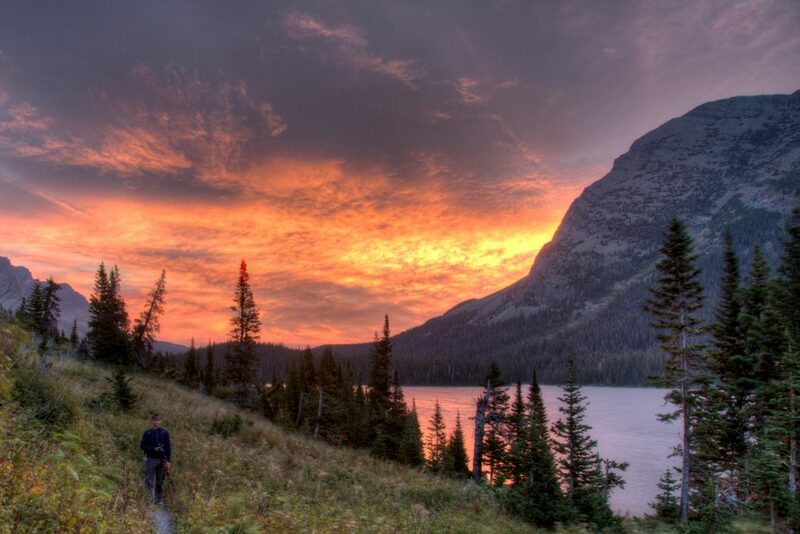 After moving our stuff into the cabin, we grabbed the cameras and walked down to Swiftcurrent Lake to take a look around. There was nothing worth taking photos of, but it was great to finally see the area I’d seen in so many maps, photos, and 3D renderings on Google Earth. We had an early wakeup planned for the next morning so we headed back to the cabin for some sleep. Given the extensive time I had for planning the trip, I had had enough time to think about trivial details like the fact that my body was accustomed to the air at sea level and not that thin mountain air. I wanted to give myself some time to adjust, so I had planned for the first day to be pretty laid back. Mostly driving and overlooks. It didn’t really turn out that way, but the first day was one of the most productive days I’ve had in my photography “career” so I was more than happy to tax my lungs a bit. Chris and I woke up hours before sunrise in pitch darkness. My plan was to photograph Hidden Lake at Logan Pass at sunrise and that was more than an hour drive away. We made it to Logan Pass with plenty of time to make the 1.5 mile hike, but as soon as I opened the door, I realized it was not going to happen. The wind had to be about 40 mph. I could barely get the door open. On top of that, it was cold and dark. 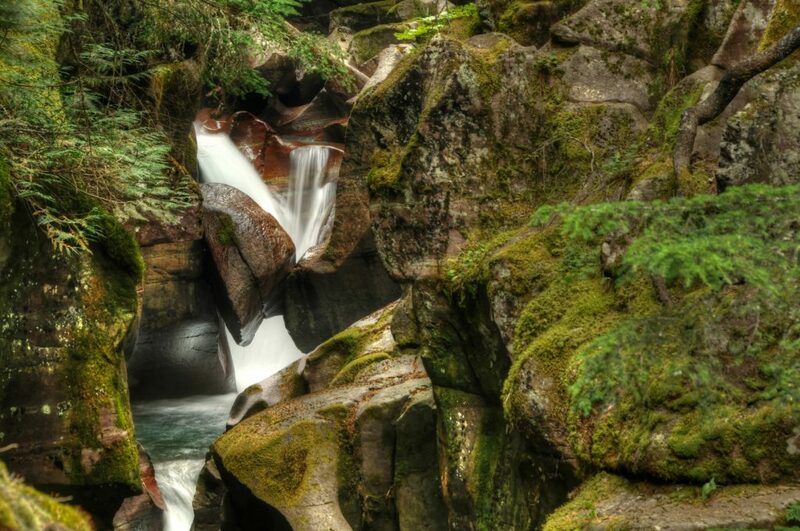 We decided to move directly to item two on the agenda; Avalanche Creek. We drove down the west side of the mountains to the Avalanche Creek trailhead and it was a lot less windy. We started the hike in the dark, but the sun was rising quickly. We found the famous waterfall at Avalanche Creek (below center), but we wanted to get to the lake. Not having thought about visiting the lake, I assumed that it would be right above the waterfall. It turned out to be 2 miles away. All along the way we saw the sky starting to lighten up and catch color so we walked faster and faster. Somehow my lungs managed to hold out and we made it to Avalanche Lake (below left) just as the sky hit perfection. Luckily, the mountains had bought us a little more time. We spent about 45 minutes wandering up and down the western shore of the lake taking photos before heading back. 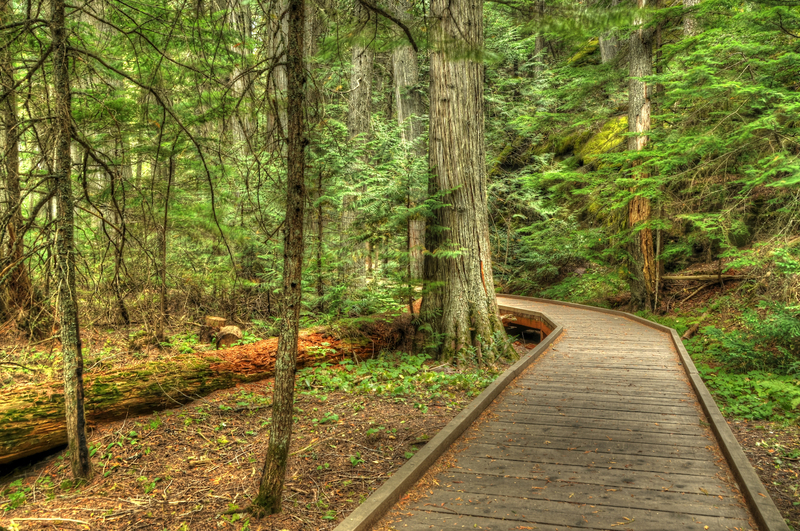 On the way back we stopped for the amazing waterfall and for the boardwalk through the Trail of Cedars (below right). Next, we headed to Lake McDonald (below left). The sun was well up by then and there wasn’t much in the way of good photos there, but that is one place where I wished I had spent more time. 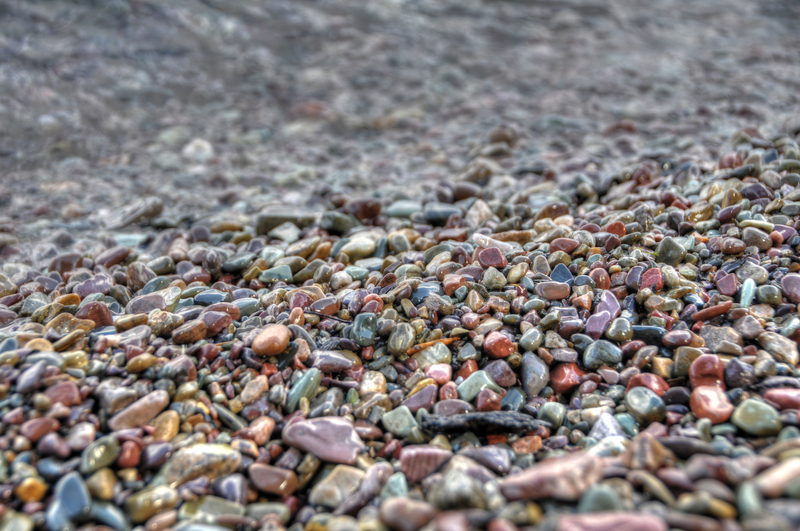 The shoreline is covered with colorful stones that would have made for great photos. Instead, we headed out the west entrance to the park and found a spot to eat. We then headed back into the park for a now well-lit drive along Going to the Sun Road (below right). The trip back was different than the drive earlier that morning. With no one on the road we had barely even noticed the construction. On the way back, we had long wait times as lines of cars had to share a single lane at spots. We stopped at several pullouts along the way. The next major stop was back at Logan Pass. Now it was around 2 in the afternoon and the parking lot was packed. We had to circle for several minutes before finding a spot. We made the hike out to the overlook at Hidden Lake (below); an easy 3 mile out-and-back with a slight elevation gain. My lungs were just about recovered from the morning speedwalk out to Avalanche Lake. We spent about 30 minutes taking photos of the amazing scenery, ourselves, and the mountain goats that wandered through. Next, we drove a few miles down the road to the Wild Goose Island Overlook (below left). 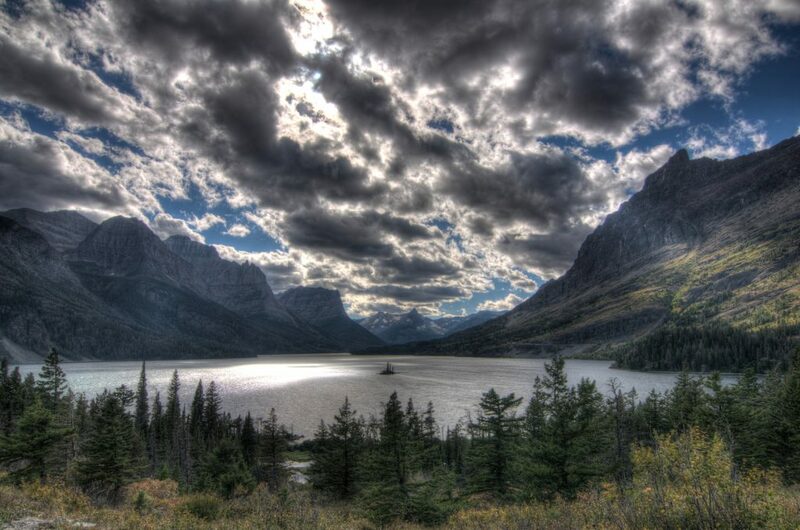 This is the iconic shot that you have to get if you’re a photographer heading to Glacier. I was lucky enough to get some amazing, dramatic cloud cover for this shot. I would have liked to linger here a bit longer, but Chris started getting restless; he’s not a fan of landscape photos, especially not iconic ones. I found him taking pictures of a caterpillar. So we drove back to our cabin. On the way back into the Many Glacier area, we encountered our first bear jam. There were dozens of cars lining the road so we knew that there must be something worth seeing. 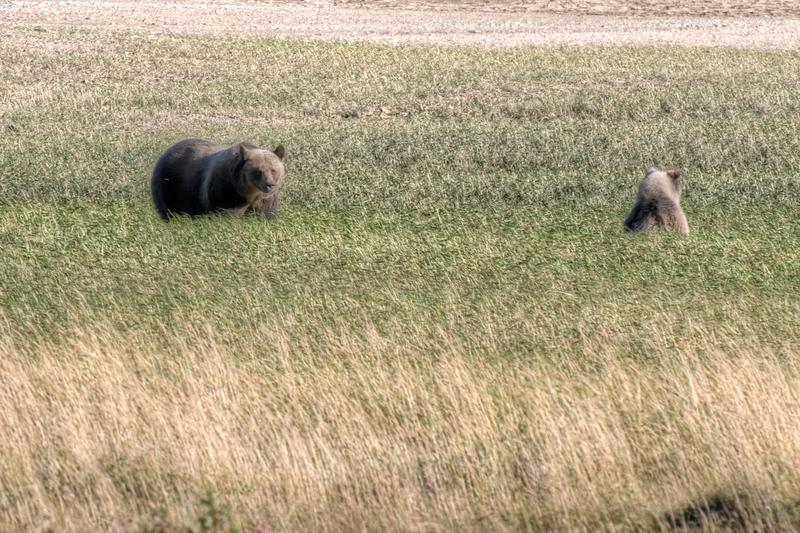 We parked and wandered to the front of the pack and saw a mother bear and her two cubs quite a distance off. Both Chris and I were excited to see wildlife, bears especially and we didn’t know if we’d get another chance so we snapped dozens of photos. Little did we know that we would have much better, closer, and scarier encounters with bears during the trip. We still had to catch sunset, so I tried to figure out where we could expect to have a good view of the western sky with something interesting in the foreground. I thought the eastern edge of Swiftcurrent Lake near the Many Glacier Hotel would be a good spot. As we walked from the parking lot toward the lake, I saw that the hotel itself would make a great foreground, so I stood there and waited for decent light. By that time the wind was howling. It was hard to stand there, but I’m glad that I did. During the twilight, I still had time to get down to the lakeshore and snap some photos before the light went away. On our second full day in the park, the plan was for the first real hike. An 11 mile out-and-back hike to Iceberg Lake. It was our good fortune that the trail had just been reopened after having been closed because of bear activity. The trailhead was right near the cabin. Once again, we set out in pitch darkness, guided by headlamps. The warnings about bears had us a little nervous so we made a lot of noise. The first half mile of the trail is the most strenuous. It rises rapidly before leveling off. I thought I was in for a long, hard day but eventually things got easier. The hike out was uneventful. It is a great hike. One of the best I have ever been on. The hike curves around a huge valley and you can see your final destination from quite a ways off so you get hints of what to expect all along the way. It unfolds like a story, but the ending of the story still takes you by surprise. About a quarter mile before the lake, you walk through a grove of trees, turn 90 degrees, and see the view in the photo to the left. Simply breaktaking. We spent almost 2 hours at Iceberg Lake; taking photos, eating breakfast, and just soaking it all in. That entire time we were the only ones there. It was fantastic. We finally decided to go back. 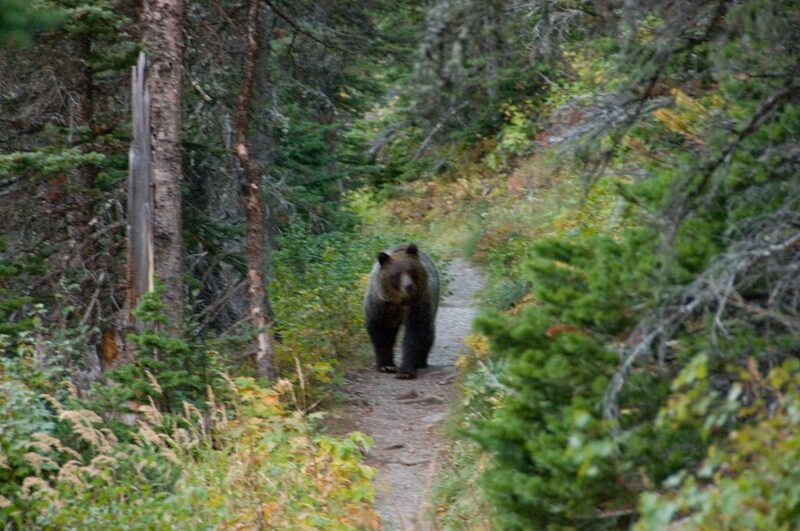 It wasn’t until we started to leave that we encountered other hikers on the trail. We got back to the cabin around 1 p.m. and spent a couple hours eating lunch, resting our feet, and looking through the morning’s photos. We also discussed where to go for sunset. My feet were beaten up, but we thought a short hike out to Red Rock Falls would give us some good photo opportunities. On the walk back to the falls, we decided to follow the trail all the way out to Bullhead Lake where I had read is a good place to spot moose. That made the total round trip 8 miles. The hike to Bullhead Lake was thankfully level. We set up on the northern shore and waited to see some moose. We never saw moose, but after sitting there for 20 minutes we saw a large grizzly bear wander out of the woods about 500 yards away. We were simultaneously excited and anxious because it was back in the direction we had come from and needed to go to get back to the cabin. We watched it for about 5 minutes before it wandered back into the woods lining the shore. A couple minutes after that, we saw a woman walk down the trail and to the shore of the lake, not far from where we’d seen the bear. She took off her shoes and stepped into the lake. I set my camera down and ran in her direction to warn her. She gathered up her things and moved back down to where my friend and I had been sitting. Shortly after, her husband joined us and we filled him in on our bear sighting. Before we could finish the story, the bear wandered back out of the woods and up onto the trail. We watched from afar, though we moved a bit closer now that we could see where it was. It was poking around in the bushes, presumably looking for berries. The closest we got was about 300 yards. When it finally wandered off we were still very excited. Seeing a bear that close is a spectacular feeling. On that note, we hiked back to the cabin to close out our day. After the bear sighting, it was easy to forget that we had walked 19 miles that day. 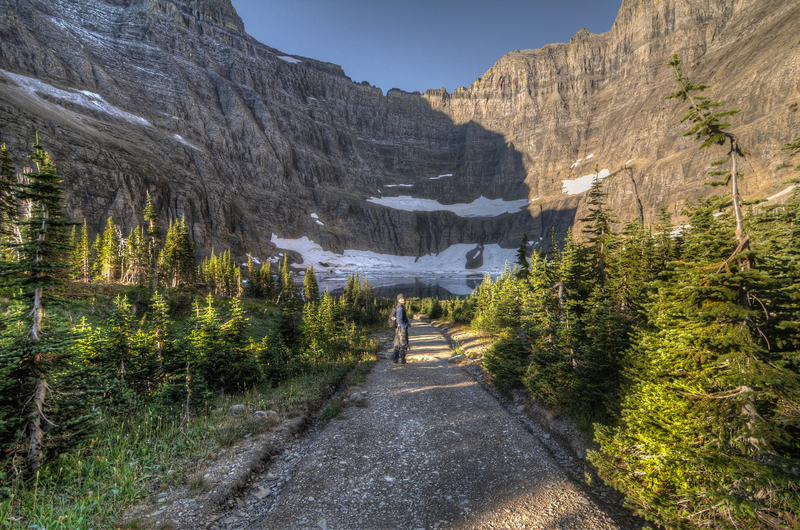 The next day was slated for a hike to Grinnell Glacier; a more strenuous 9.5 mile out-and-back. The hike starts out very easy with a flat hike to the shore of Lake Josephine. From there the trail angles upward. It isn’t until the last half mile that the grade increases dramatically to the point where you’re walking up stairs carved into the rock. At the west end of Lake Josephine, there is a split in the trail. 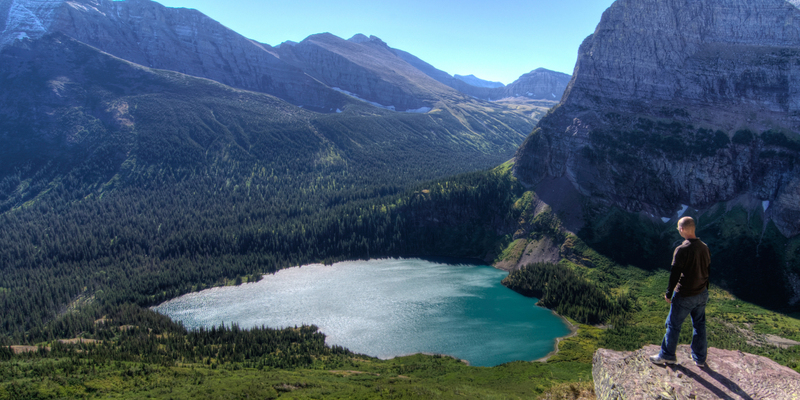 You can either go up to Grinnell Glacier or down to Lake Josephine and Grinnell Lake. We took the high road to Grinnell Glacier. We were a few hundred yards up the path when we looked down (we were up pretty high up by this point) and saw a bear swimming in a stream below. We were close enough that we could tell it was a bear, but far enough that we couldn’t get decent pictures of it. Chris wanted to head down; since we’d seen the bear first, we could control our approach and stay a safe distance while still getting some decent pictures. I was intent on getting to the glacier though. My feet and lungs had taken such a hit over the last couple days that I was convinced that if I went down, I might not want to go back up. Who knows if that glacier will be there the next time I visit. My stubborness won out and both of us were a bit upset as we hiked upward. The rest of the hike was uneventful. We stopped several times to take photos of the dramatic vista and occasional wildlife. Chris was (and is) in better shape than I am, so we were separated by some distance throughout the hike. It wasn’t until the hike back down that he said he had seen bighorn sheep. I had totally missed them; my vision narrowed by lack of oxygen no doubt. The arrival at Grinnell Glacier (below) turned out to be anti-climactic. The wind was howling at, at least, 40 mph. It nearly tipped my camera over on it’s tripod. That combined with the glacial ice, made for a chilly reception. We didn’t stay long. Just long enough to snap a few photos and to allow me to stick my face into the glacial lake. Immediately after coming off the summit, the wind died down drastically. We went back down the trail the same as we’d come up; stopping for occasional photos. Once again we went back to the cabin to relax and take stock of the morning. I don’t remember why, but that evening we didn’t go out for sunset photos; just ate in the Swiftcurrent Inn restaurant and hung out until dark. 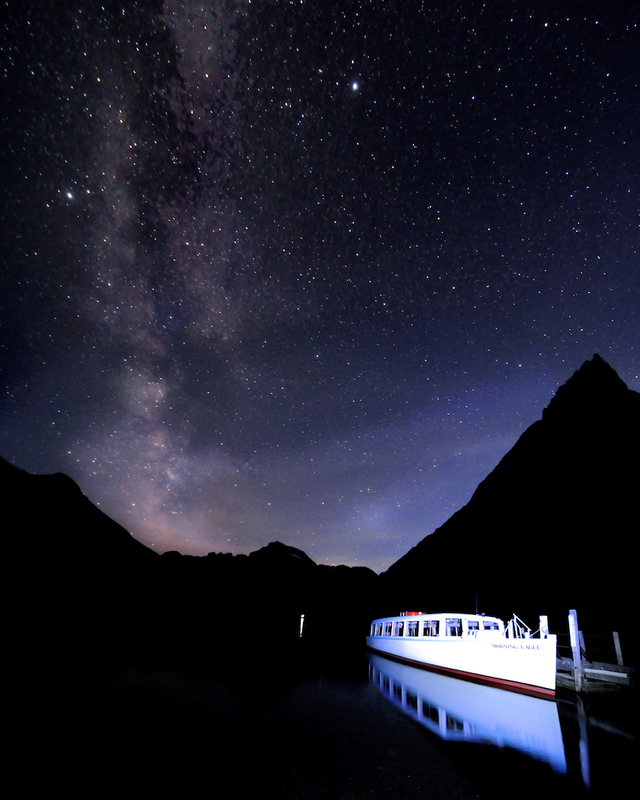 One thing that I had been longing for was star photos. I had taken some before, but living in DC it is nearly impossible to find a place where the stars aren’t overpowered by city lights. So I decided to venture out. Chris wasn’t interested so I was on my own. I wanted a place that would have a decent foreground and was far enough away from the Swiftcurrent Inn to avoid any of the lights, so I went back to Lake Josephine, which we had passed by that morning. It was about a mile and a half walk out there in complete darkness along a trail that was hemmed in closely by trees. I was very nervous about bears. I had my headlamp on for a while, but I realized I couldn’t see anything past the edge of the light. So I turned it off and walked in darkness. Once my eyes adjusted, I could see well enough to at least see movement well out ahead of me. Not to be overly dramatic, I never did see a bear. I made my way out to the shore of Lake Josephine where there is a boat docked. I spent 30 minutes taking photos, trying to get my settings right to bring out the Milky Way I could see well enough with my eyes. At some point, I saw a speck of light on the far end of the lake. It slowly made its way toward me and I heard voices. It is a big lake and it took awhile, but a couple of hikers eventually came down the trail. I asked if they minded if I tagged along with them back to the trailhead so I could be slightly less worried about bears. We wandered back and I managed to not get eaten. Another 12+ mile day done. As I’m sure you’re sick of me reminding you by now, I planned this trip out well in advance; long before I knew Chris would be coming. Chris is a fly-by-the-seat-of-his-pants kind of guy, so he didn’t want to plan much. That led to tension throughout the trip (like the previous day) as I tried to stick to my plans and my landscape photography, while he tried to find impromptu adventures and elusive wildlife. Our last day in the park was our compromise day. The day I had planned for spontaneity (I know, I have a problem). We decided that we would hike out to Grinnell Lake, a small lake that lies below the glacier we’d hiked to the previous day. We thought that would be a great place to find some wildlife and after some strenuous hikes, the level trail back to the lake would be a welcome relief. Wanting to get back there during the morning, when we thought wildlife would be most active, we set out before sunrise. We made the 1.5 mile hike out to Lake Josephine (below left and right) quickly. We were skilled at it by that point. We started walking the shoreline and then one of us (I don’t remember who) looked back and saw an amazing sunrise starting to happen. We weren’t really in a good place to take advantage of it so we hurried down the shore, occasionally looking back over our shoulder trying to find a decent vantage point. Every so often we’d stop for a picture. After about 5 minutes of this we rounded a blind curve and 150 yards ahead, right in the middle of the trail, was a huge grizzly bear. We stopped, the bear stopped, and we all stared at each other. 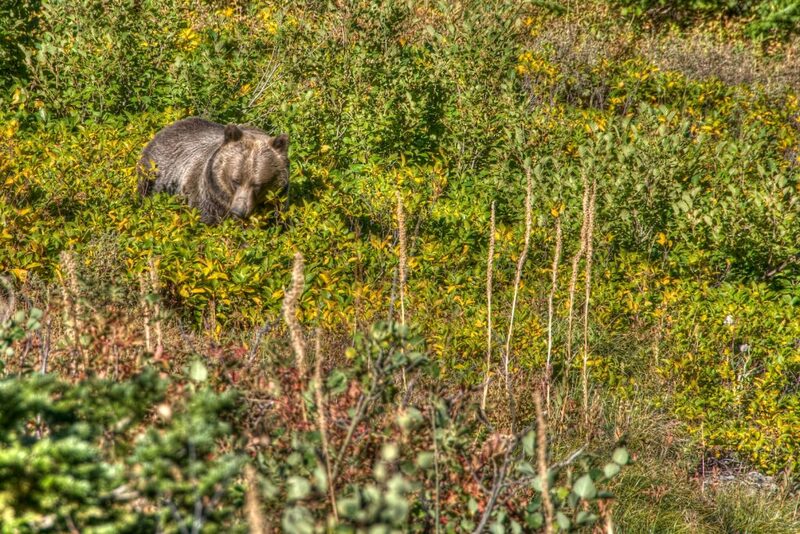 I kept fiddling with my camera, oblivious to the danger we were in, as Chris readied his bear spray. We had read enough to know you don’t run from a bear, but we didn’t slowly back away either; we just stood there. The bear, for its part, did the same; not advancing but not backing down. Eventually, the bear (with I’m sure some annoyance) turned 90 degrees and walked off the path into the woods. We heard his crunching and weren’t sure what to do. We wanted to go forward but couldn’t see the bear; only hear him. We worked up the courage to move forward and made plenty of noise of our own so that we could all hear each other. That seemed to work well. That drama behind us, we were giddy the rest of the way out to Grinnell Lake. We saw some elk on the far side of the lake, but much to far away for photos. We hung out there for awhile before heading back. On the way back, we took the short, steep side trail to Hidden Falls. We then walked back to Lake Josephine. We walked along the southern edge of the lake and watched as the first boat of the morning brought a load of people across the lake. And that was it. We hiked back to the cabin and spent the rest of the day packing, resting, processing our photos, and buying souvenirs. On our last day, we, once again, woke up before sunrise. We hopped in the car and drove the 3 hours back to Great Falls Airport and flew to our respective cities. I don’t think I would change anything about what I did. I would certainly like to spend more time in Glacier, hike more trails, see more things. This trip was appropriately sized though. I don’t know if my feet could have handled any more hiking. I have since bought more durable hiking shoes. That may have saved me some soreness. As I mentioned earlier, I would like to spend more time on the west side of the park, near Lake McDonald. I would have liked to hike the Garden Wall. I would also like to check out the Two Medicine area of the park and visit Waterton Lakes, the Canadian sister park to Glacier. In 2012, the National Park Service had an ad campaign for National Parks Week called “Picture Yourself in a National Park.” I had taken that to heart during a trip to Shenandoah earlier that year and it stuck with me. Leading up to the Glacier trip, I thought of different ways I could work myself into a photo. At some point along the way, I saw a picture of a couple women (a mother and daughter, perhaps) standing near a cliff with a wide open valley behind them. Luckily, it was geotagged so I could see that it was taken along the Grinnell Glacier trail. The whole hike to the glacier, I was looking for this spot. I don’t know that I found it, but I found a close enough approximation for my purposes. 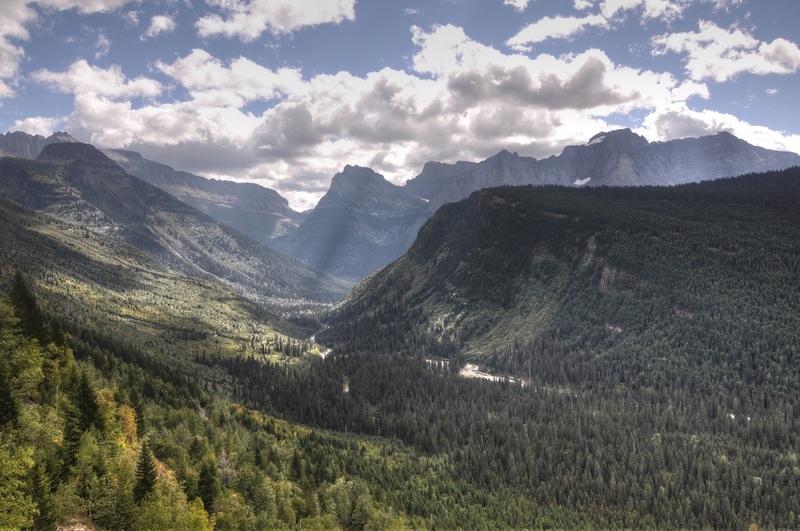 Glacier National Park on NPS.gov – Get information straight from the people who know best. My Glacier National Park Gallery on Flickr – A collection of my photos from this trip on Flickr. My Glacier National Park Pinterest Board – My collection of other people’s photography from this park.